So, it would appear that slightly more than 50% of Canadian physicians use some form of electronic chart. Interestingly, of these physicians, roughly two thirds still use a mix of electronic and paper charts. The Canadian Medical Association (CMA) today unveiled their new five-year strategy for HIT investment in Canada. This strategy is a key component of the CMA’s Health Care Transformation Change That Works, Care That Lasts initiative launched in August. 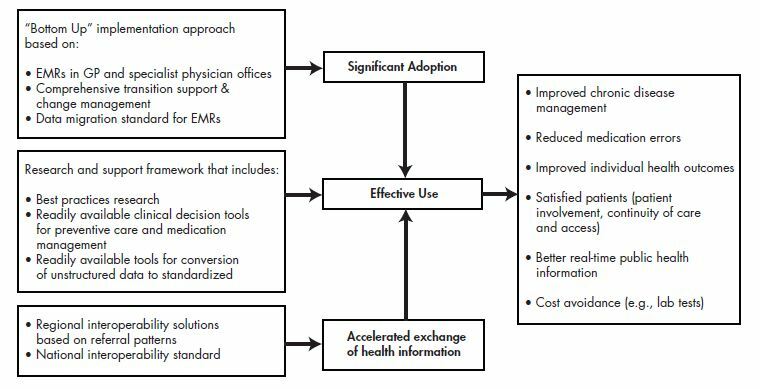 As shown in the figure below, CMA’s strategy is based on three key pillars: Significant Adoption, Effective Use, and Accelerated Exchange of Health Information, which, together, will drive specific and measurable objectives. I encourage you to read the CMA 5-Year HIT Strategy. It reflects the considered thinking of an important stakeholder group, one that for many years was accused of resisting HIT adoption. The CMA’s 5-Year HIT Strategy demonstrates a clear understanding of the benefits that HIT has to offer and suggests a path towards quicker returns on HIT investments. In the debate surrounding this resolution, one delegate stated that Infoway’s plan to directly fund vendors to meet interoperability standards is “counterproductive”. Another delegate commented that some eHealth agencies takes the position that “It is our way or no way” and noted that Infoway can play an important role in advancing local initiatives. Give me the damn data! Although their reasons may differ, both physicians and patients seem to have a similar rallying cry – “Give me the damn data!” The common denominator in both cases is the role that IT can play in making the data they need to deliver care and manage their health.